A Cajun might take issue with the name of this dish; maybe it should be called Un-Dirty Rice. Down & Dirty Cajun Rice is a fresher take on the Louisiana classic Dirty Rice and pulls just a few key elements from the original to make a fantastic side. Don’t get me wrong, I love the authentic version of Dirty Rice. It gets its signature flavor (and name) from chicken gizzards & livers. My Down & Dirty Cajun Rice is just a simple side but still absolutely delicious. 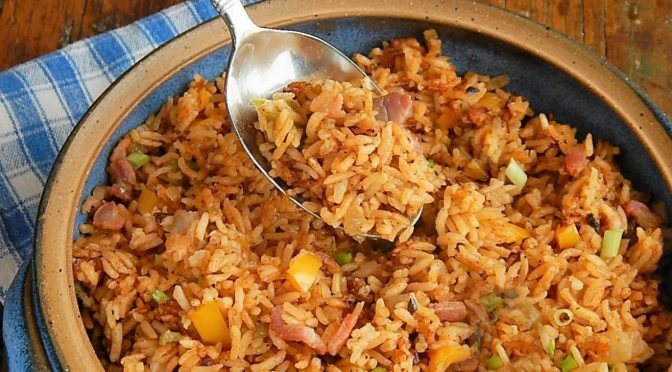 Down & Dirty Cajun Rice has a clean fresh flavor with just a heat of heat and a touch of smokiness from the bacon & the cooking method. Down & Dirty Cajun Rice is like Paella in that it forms a little crunchy, toasty layer on the bottom of the pan. It’s just so good! It’s a perfect side with spicer Grilled Cajun Chicken or my newer favorite, Cajun Stuffed Chicken Breasts. This recipe is fantastic with any barbecue dishes, maybe ribs or pulled pork. If you’re after a meal, rather than a side, feel free to toss in a little ham or sausage to heft it up. Rinse your rice thoroughly, really, really well. Rinse it several times and it will remove a lot of the starch that could otherwise give you heavy, soggy, sticky rice. The bacon infuses the dish with a smoky flavor, but really watch the heat level & use your nose to get a crunchy, toasty layer on the bottom of your pan. None of the ingredients for this dish are expensive on their own, although the price of bacon seems to be rising and rising and bell peppers can be a lot pricier out of season. I did a write up on all the strategies I use to bring this dish in at a bargain. Think of Down & Dirty Cajun Rice if you’ve got a little leftover barbecue, either chicken or pork, or leftover ham from a holiday dinner. Just toss it in the dish. Down & Dirty Cajun Rice is a little like a chameleon and can take on all kinds of flavors. If you have leftover rice, try it for breakfast! Heat it in a small skillet, then make a hole and drop in an egg to cook through. A healthier play off Dirty Rice. Heat a large pan or Dutch oven, add bacon and fry until crisp. Add onion, celery and bell peppers, saute until vegetables are slightly softened. Stir in garlic and cook for about 30 seconds longer. Add a little oil, at any point if mixture appears too dry. Add rice, stirring to coat, and cook for about a minute. Quickly add salt, pepper, cayenne and hot sauce. Immediately add chicken stock and stir in bay, oregano, thyme, and parsley. Bring to a boil, cover with a tight-fitting lid and turn heat down to a bare simmer. Simmer 15 to 17 minutes. Taste for texture: rice should be al dente with a bit of a bite, but tender. If not, quickly replace lid and cook a moment longer. Watch the heat level towards the end of cooking; the rice should form a bit of a crust on the bottom, but not be burned. If you catch any scent of burning, remove the rice immediately from the heat and let it cool down for just a minute. When done, turn heat off, leaving lid on and rest for five minutes. Fluff with a fork. Use a spatula, if needed to bring any toasted rice up to the top of the dish. Remove bay leaves and garnish with green onion. Shortcut this recipe by using a tablespoon of a Cajun Spice instead of the individual spices. If you’d like, save out a little of the bacon when it’s crisp and use it to garnish the rice when it’s done. This entry was posted in Click here for Fabulous Food Posts and tagged Bacon, Bell Peppers, Cajun & Creole, Easy Recipe, Frugal Hausfrau, hearty sides, Rice, Side. Bookmark the permalink. Love dirty rice, you are amazing, $1,74 Wow!! LOL! Aldi! And of course, cheap rice! This week the Green Peppers are about 30 cents each! So next week Stuffed Peppers? Chicken Cacciatori? I picked up four or five packages!